Scones--they evoke imagery of having an English tea on floral patterned, Victorian, furniture and talking about the "Queen Mum". (Who...I...suppose...is this Queen's mom? Yes?). In my never-ending quest to make more new and delicious breakfast foods (because I have a hard time eating normal, quick, breakfasts for some reason), I decided it was time for scones to make an appearance. And these looked like such a yummy way to introduce myself to them! Brown sugar-yum. Cinnamon-yum. Oats-I'm a fan. Whole wheat-woo hoo! Admittedly, I had a smidgen of a hard time with these. The dough was so wet I wasn't really able to separate/move them to the baking sheets without causing most of the scones to become horribly misshapen. I'm unsure how to solve this issue/what I did wrong. Perhaps I should have put more flour in. However, since this was my first foray into scones, I thought perhaps they were supposed to be that way? But if they are...how in heaven's name can you get them to the baking sheet/separate them from each other after cutting? All my scone making friends-I'd love any feed-back! Anyway, technical issues aside-these tasted phenomenal! 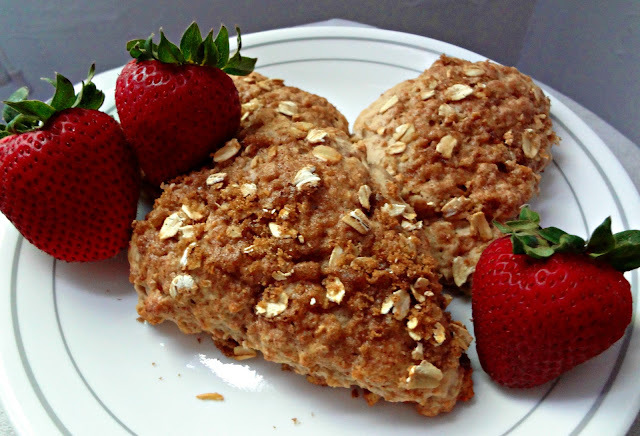 Satisfying, hearty from the wheat and oats, and with just the right amount of sweetness. Definitely one of my favorite things I've made for breakfast...honestly I even ate some as snacks because I had such a hard time keeping myself away from these. They really are so delicious! I suggest you give these a try, they make morning times happy :). Slightly adapted from The Girl in the Little Red Kitchen's "Cinnamon Oat Scones"
In a large bowl mix flours, sugar, baking soda and baking powder, salt, cinnamon, and nutmeg (if using). Cut butter into the dry ingredients using a pastry cutter or your hands, until it has the consistency of sand. Create a well in the center of the bowl and pour in the vanilla extract and gradually mix in the milk (may not need all of it). Do not knead. 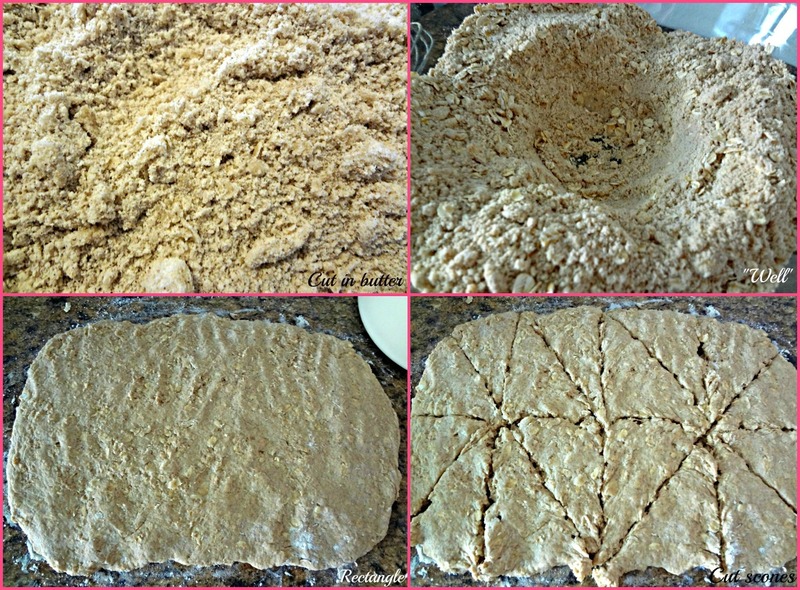 Turn the dough onto a lightly floured surface, gather it together, and pat it into a 1/2 in. thick rectangle. The dough will be sticky--but not so much that you cannot move the cut scones. Cut down the center horizontally, then make 4 vertical cuts (resulting in 8 squares). Cut each square on the diagonal to result in 16 scones. Transfer to a parchment lined baking sheet and brush the tops with the 1/4 cup of buttermilk. 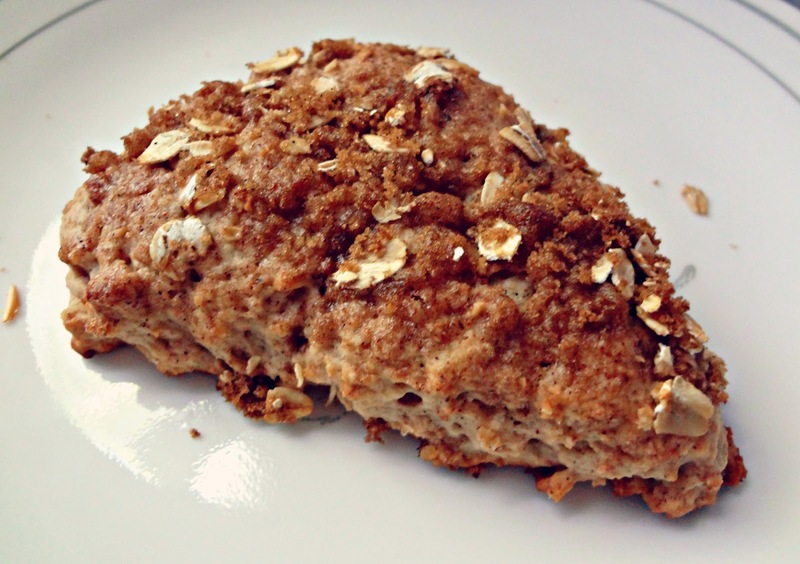 Mix the oats, cinnamon, and sugar for the topping and sprinkle over each scone, evenly. Bake 14 minutes, until lightly browned.